Cuddly Cubs Diaper Changing Table Pad Cover Set For Baby Girl | Soft & Breathable 100% Jersey Cotton | Adorable Unisex Patterns & Fitted Elastic Design | Cute Nursery & Cradle Bedding Sheets 2-Pack by Cuddly Cubs at My Pregnancy Place. MPN: 16x32Pink. Hurry! Limited time offer. Offer valid only while supplies last. Code ''Brown'' Emergency? Here's How You Can Make Changing Your Baby's Diaper 100% Fuss-Free! Looking for a set of premium baby changing pad covers? Code "Brown" Emergency? Here's How You Can Make Changing Your Baby's Diaper 100% Fuss-Free! Looking for a set of premium baby changing pad covers? Want a unisex changing pad cover set for your baby boy or baby girl? Need a convenient, washable and practical cradle sheets set? Introducing The Ultimate Changing Table Pad Cover Set By Cuddly Cubs! Now you don't have to settle for all those cheaply made nursing bedding sets anymore, since the Cuddly Cubs plush changing table cover 2- pack is here to help you keep your baby safe, comfortable and happy! Why Choose Our Summer Infant Changing Pad Cover? Breathable & Ultra-Soft - The 100% jersey cotton fabric will keep your baby cool during hot summer days and warm during chilly winter nights while the jersey knit is ideal for your newborn's delicate skin. Fully Fitted With Elastic - Stop struggling with frustrating waterproof changing pad covers that never stay in place. Our stretchy munchkin, cloud island changing pad cover girl or for boy, features smart elastic, which will fit any diaper changer or cradle mattress. It fits well as cradle sheets fitted 18x36x2 size pad. 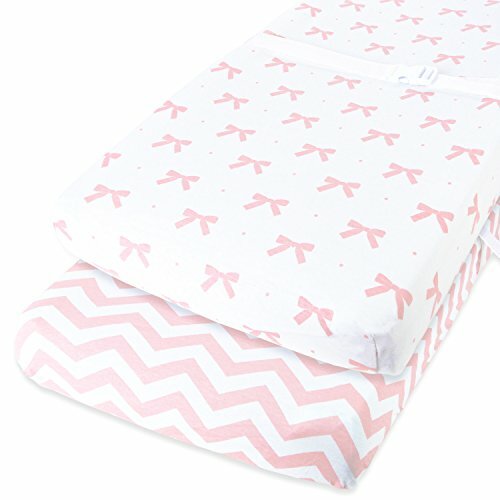 Adorable Pink Patterns - Unlike all those boring baby changing pad covers, our bow and chevron pink changing pad cover are perfect for baby girls! Our jersey cotton changing cover with beautiful baby shower gift pack is a better option than aden anais, burts bees, la baby, graco or poopoose changing mat cover. The Cuddly Cubs diaper pad cover 2-pack comes in a deluxe gift box, ready to make any new mommy happy! Your purchase is covered by our exclusive LIFETIME PEACE-OF-MIND GUARANTEE! What Are You Waiting For? It's 100% Risk-Free! Click "Add To Cart" NOW If You Want The Softest & Cutest Changing Pad Sheets For Your Baby! ONLY YOUR HUG IS SOFTER THAN OUR CHANGING PAD COVERS! Made from 100% jersey cotton fabric, the Cuddly Cubs washable summer infant changing pad cover set will protect your newborn's delicate skin while creating a soft and cuddly surface, so you can change your baby's diaper in comfort. YOUR CHANGING PAD SHEETS WILL GET SOFTER WITH EVERY WASH! How? It's the fabric! We have used only the highest-quality jersey cotton, which is not only naturally antibacterial, but will also get softer and softer after every washing cycle. Plus, our change pad covers are tear-resistant and 100% machine washable. FOR A LIFETIME OF HASSLE-FREE DIAPER CHANGING! Being parents ourselves, we know exactly how hard it is to find well-made and durable baby products. That's exactly why we back our changing pad cover 2-pack with a LIFETIME GUARANTEE! If you are not 100% thrilled with the ultra-soft design, we will offer you a full refund! UNLIKE OTHER CHEAPLY-MADE DIAPER PAD COVERS that never stay in place, our nursery bedding sheets are fully fitted with encased elastic, so that they stay firmly in place even if your infant is wiggling around. And the best part? The 32" x 16" x 6" design will fit almost all standard changing pads and flat changing table pads. LOOKING FOR THE MOST THOUGHTFUL BABY SHOWER GIFT IDEA? Surprise every new mommy with the Cuddly Cubs chancing table sheet 2-pack and help her change her baby boy or baby girl with confidence. The elegant pink chevron and adorable little bows patterns are perfect for girls.